I left Mahahual Sunday at noon. I asked people around town and they said that there was a bus leaving at 10:30, which would give me enough time to make it to the airport and meet Ali when he was scheduled to arrive at 3:30. It happened that the 10:30 bus was going to Chetumal; I would have to wait till 12:30 to catch the bus to Cancun, making me late for Ali. On the bus, the driver told me I should transfer in Playa del Carmen because it was either cheaper or faster, I couldn’t understand. I heeded his advice and transfered in Playa del Carmen. 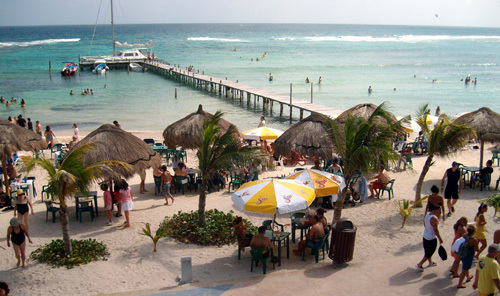 I ended up having to wait for an hour and 15 minutes in Playa del Carmen. I called Ali, who had been waiting at the airport, and he decided to go the the hostel and wait for me there. I finally arrived at the airport by 7 and went to the National rent-a-car. I mistakenly signed up for an extra driver and total coverage of insurance, thinking it wasn’t costly per day, especially divided by two people. When I made the reservations, the price was listed as $10 a day. The car for two weeks, with total coverage, after I upsold myself, came to about $850. I wasn’t really thinking of the total price, just the daily price, which still didn’t seem that much. I checked the car for blemishes with the attendent, where he proceeded to demonstrate that there was a spare tire. I don’t even know if I saw it though. I drove through the hotel zone looking for the International Club, which is the hostel where Ali booked our beds. I stopped in front of a gigantic hotel on the beach by the name of International Club and had my doubts that this was the place that Ali had booked. I called him up and, after some questions and answers, I discovered that he was in Downtown Cancun, on a small street, which I identified on the map. Actually getting there proved to be more difficult. I drove in circles for about an hour and stopped to ask directions twice. I’m still not used to the road sinage in Mexcio. Eventually I found it, parked, went inside and greeted my friend. This happened to us too. It’s a total scam. I got a car from National in Cancun for two days. January 11th and January 12th, 2009. I was going to have it longer but decided I would save the money and just bus it. When I returned the car, surprise, surprise, no spare tire! Although the jack was still there, and there was no forced entry. Who steals a spare tire out of a trunk? And magically without making a mark. And leaves the stereo and everything else. Everything became clear. When I picked up the car, the attendant pointed out that there was a spare tire and jack, he even showed me, which I thought was a little odd. I didn’t get a good look at it because I wasn’t planning on getting scammed. I can’t even say for certain if it was in there to begin with. I started to raise my voice and tried to reason with them. I said how could this have happened without there being a mark? Someone must have had a key. Does this happen a lot of Cancun? Are there spare tire thieves preying on rental cars at National? I plumb accused them of robbing me. I said I wasn’t paying and I wasn’t going to sign the receipt. Later I realized that I already signed two credit card receipts when I picked it up. I’m going to try and cancel it with my credit card company. They charged me 2700 pesos, that’s nearly $200 for a spare tire. I mistakenly bought the full coverage insurance and thought if I crashed the car, I wouldn’t have to pay anything. Their reactions sealed their guilt. They were not moved by my reasoning or anger. If it had been stolen, you would think they would have been sympathetic or surprised. They bowed their heads in shame and maintained their well-practiced stone-like posture. Eventually, all they rebutted with was, “you were responsible for the tire.” Not, “Don’t accuse us” or “we didn’t do it” or “this thing happens all the time” or “I’m sorry for your misfortune.” At least they could have faked it. They just kept saying, “you were responsible for the tire.” It’s not there and you have to pay us. I’m sure they took it out after they showed it to me when I went in to sign the papers. These missing spare tires can’t be a coincidence. The day after my doubtful last post, we took 10 passengers out for a two hour sail. Five were a group of Arkansas teenagers from the cruise ship. The others were from Mexico City. One girl worked on one of the cruise ships and was with her Norwegian boyfriend and her parents. It felt good to finally be putting the boat to work, to have a purpose and to not be so bored. Gary let all the teenagers take a turn at the wheel. We were out for two hours and everyone came back happy. The tour guides at Tequila Beach sold the tickets so they got 30% of the $40 ticket price. There’s not much Gary can do to lower the percentage of their share as that’s the price for using their facilities. The best we can do is find business independently, online, at the hotels, through taxi drivers, wherever. The next day, Wednesday, turned out to be prosperous as well. Tequila Beach had 25 people lined up for the cheaper, $20 snorkeling trip. Normally they do these on their own, with their pontoon boat, but 25 was more then they could handle at one time, without going twice—which there wasn’t enough time for—so they asked Gary if he could take the party. Five people ended up changing their minds so we took out 20 people on Crystal Blue, with a guide from Tequila Beach, and we used their snorkeling equipment. This party was composed of some Americans and Brazilians. This time Tequila Beach took 50% because of their guide and equipment. It was what Gary expected, so he wasn’t disappointed. I’ve been in Mahahual for a week and a half and feels like forever. I’m sort of in limbo now, waiting for my friend from San Diego, Ali, to come on the 11th. I haven’t ventured outside of the town because I don’t want to do anything twice. I’m also saving my money because I’m sure I’ll spend a lot when he gets here. 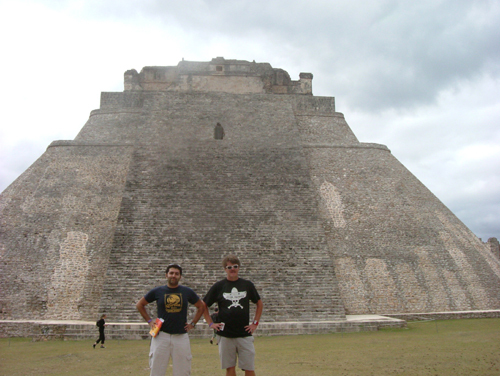 We’ll have two weeks, with a car, to explore all of the Costa Maya. I thought about flying to Mexico City and couchsurfing but I haven’t bought a ticket yet. Perhaps I’ll go before Havana. If I buy tickets now, I can get them for $60 one way from Cancun. On New Years Eve I went to a party on the beach, surrounded by jungle, just north of the lighthouse. It didn’t get going until after midnight. There was no count down, just a bunch of shouts when the clock struck 12. The crowd was mostly the ex-pat locals. There were Canadians, Germans, Italians, Austrians, Mexicans and Mayans. I took a nap beforehand, from 6 to 8, so I could last longer. When I awoke Gary and Larry already turned in for the night. At 1 I called my friends in the States to wish them a happy New Years. I went home at 4. Check out the new wavy tabs above. I’ve been wanting to improve the design of Sailust.com for quite some time. Specifically, the top navigation is boring and worse, barely noticeable. It was quite a pain to find out how to remove the newline characters between the list elements so that there would be no spaces in between each wave. After some Googling I came upon this post, which helped me solve the problem. Now all I need is a logo.